Torture Methods - Communist Torture Methods: The Craft of Breaking A Man - An abridged list and description of 49 torture methods used by Polish Secret Police: MBP (Ministerstwo Bezpieczenstwa Publicznego), UB (Urzad Bezpieczenstwa), SB (Sluzba Bezpieczenstwa - commonly known as Bezpieka) against Doomed Soldiers and Democratic Opposition in Poland. Latest News: Retired Central Intelligence Agency (CIA) Officer Gene Poteat Speaks Out About the Crash of Polish TU-154 Plane Carrying President Lech Kaczynski In Smolensk, Russia: "Russian Image Management - The KGB’s latest intelligence coup, and NATO’s latest intelligence disaster"
Nomenclature: "Interrogation", "Coercive Persuasion" and "Torture"
The interrogation of prisoners, especially political prisoners, is highly charged. There was a never an administration that though it had too much power, and due process always seems a burden. Of course that is the administration, those on the inside. For those on the outside, it can be - and usually is - a very different matter altogether. What methods are acceptable is an area of contention, usually conducted in an atmosphere saturated with fear. It is easy to manufacture fear. It is even easier to counterfeit it. To manufacture fear, you actually have to mobilize a credible portion of the populace, i.e. get people outside the administration to buy-in to the fear. To counterfeit fear, you need merely silence those who call fear into question, while propagandizing continued warnings. When the power of the populace has been weakened; through rubber stamp legislatures, kangaroo courts and apparatchiks eager for advancement and indifferent to human rights; any and all interrogation methods will find license. Then again, not all activities called "interrogations" are intended to elicit information. Some represent administrative, extra-judicial punishments. Some are not even intended as punishments, but rather as an effort to totally break down the individual will entirely so that the prisoner can be shaped and remolded into convenient and useful form. All this is part of the evaluation of the processes used to coerce the prisoner into conformity with administration objectives. Let's first consider what a "real" interrogation is. We will use the definitions "activities engaged in by an agent of the state to elicit information." In short, we will be leaving out extra-judicial punishments and aggressive wholesale breaking down of the prisoner's personality. We have not, however left out efforts to elicit information which the state has no legitimate claim to or interest in. An interrogation can be no more than a fishing expedition or the seeking of politically useful information. The question is often asked "If you have nothing to hide, why do you not tell us everything you know?" The hidden meaning here is that "Only the guilty have something to hide." In truth, the common citizen may have a great deal to hide, or rather keep in themselves. This is especially true, when an administration treats as a crime opinions and activities that are not criminal, but terribly inconvenient. “Col. Dusza is merciless towards his subordinates [in the UB]. Much work is needed for him to understand the nature of a human being; it was accomplished in the last phases. He carried out the orders of the leadership blindly. Perhaps in order to excuse him for his unapproachable character one could add that this is the way he was expected to be viewed by the leadership […] This unit lead by Rozanski was divided into two sections; investigative, and executive. I was in the investigative section lead by Michalszczyn, and then [Ludwik] Serkowski. 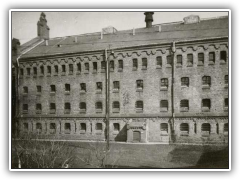 We stayed at the Mokotow [prison] all the time, where we literally lived. I would receive orders from the leadership of the section, however Rozanski who came every day and would give us suggestions and more important orders. I didn’t have any formal investigative training, and carried out as I was taught there. My teachers were primarily: [Ludwik] Serkowski, Rozanski, and Humer […] From the moment I started to work at the Mokotow [prison], I witnessed instances of prisoner beatings. It wasn’t systematic then yet, but it intensified during the period of liquidation of the gangs; then it subsided. What I have in mind is the period until 1948. I learned these methods from my superiors who themselves were beating prisoners. They would come during interrogations and would beat the prisoners themselves, or would give us orders to beat them. Among them were [Jozef] Rozanski, [Jozef] Czaplicki, [Adam] Humer, [Ludwik] Serkowski, [Stanislaw] Imiolek vel. Sliwa, and many others whose names I don’t remember. There were instances, I don’t remember exactly, that the prisoners who were already tortured were brought from the Koszykowa [prison]. All investigators carried out illegal methods during various phases [of interrogations] and to the varied degree. 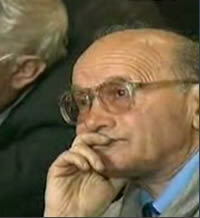 Above: Jakub Berman, (1901-1984) communist activist, member of KPP (pol. abr. Communist Party of Poland), CBKP (pol. abr. Central Bureau of Polish Communists), BP KC (pol. abr. Political Bureau of Central Committee of the Communist Party), from 1945 to 1956 Undersecretary of State in the Presidium of the Council of Ministers, between 1947-1954, Deputy Premier from 1954 to 1956. Stalin's right-hand man in Poland responsible for overseeing activities of the Urzad Bezpieczenstwa / Polish secret police. Internal memo prepared by Ludwik Szenborn, Dusza's UB supervisor in Warsaw. 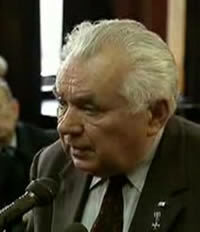 Above: Colonel Jozef Rozanski, head of the Investigative Department of the Ministry of Public Security [Ministerstwo Bezpieczenstwa Publicznego - MBP] Communist Polish Secret Police, Urzad Bezpieczenstwa, UB interrogator. 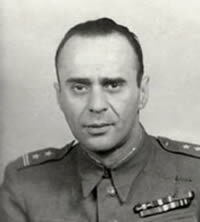 1947-1945 - Deputy Director of the Investigative Department in the Ministry for Public Security (pol. Ministerstwo Bezpieczenstwa Publicznego). 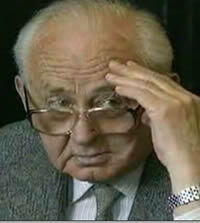 “I, Jozef Różański, was born in Warsaw on July 14, 1907. My father was employed as a journalist by the “Haynt” [newspaper]. He died in 1933. My mother worked as a seamstress, nurse, etc. She died in 1928. 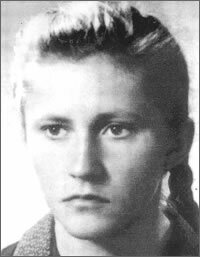 My sister Judyta was murdered in Warsaw in 1943. My brother Jerzy [Borejsza] is presently in Lublin, [and is] a Major in the Polish People’s Army, and is an editor of the “Rzeczpospolita” [newspaper]. 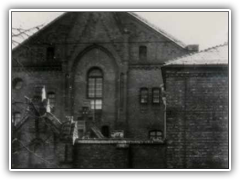 I was educated at the Gymnasium [high school] in Warsaw, from which I graduated in 1925. In 1929, I graduated from the Law Faculty at the University of Warsaw. After that, I was a Law Applicant, in the practice of the attorney Bergtal (at Sienna 45 Street, Warsaw); after taking the Bar Examination, I was self employed as an attorney until 1939. After the eruption of war [World War II], I went to Równy. I met the Red Army in Kostopol. I began to work in the “osobyi otdel” [Special Section of the NKVD responsible for Military counterintelligence of the Soviet Army], and after that, I transferred to the NKVD at the Kostopolski County (later [Kostopolski] Region). In 1940, I was summoned to Lwow, where I worked in the Political Section of the NKVD responsible for the Polish prisoners of war [who were captured] in 1939 [by the Soviet Red Army]. After the beginning of military operations in 1941 [that is, the Nazi attack on its former ally, the Soviet Union], I transferred from the NKVD in Lwow to [the NKVD unit in] Starobielsk (that was the prisoners of war camp), and from there, to Saransk (ASSR – Asian Soviet Socialist Republic). After being relieved from duty, I went to Samarkand (in Uzbekistan). While there, I worked on the collective farm [kolkhoz], and thereafter at the bakery, as a “kontrolnyi vezobsthiekh” [head supervisor]. In 1944 (on 15th February), I arrived at the Polish Army’s “Traugutt’s” Division, where I served as a political commissar on the editorial board of the “Na Zachód”, and then "Zwyciężymy" [publications]. I completed the Divisional school for political officers. From 1924, while at high school, I took part in the youth [activists’] circles, and after that, while at the University [of Warsaw], I joined the Union of Communist Youth [Związek Młodzieży Komunistycznej], and later, the KZMP [pol. abr. Komunistyczny Związek Młodzieży Polskiej - Communist Union of Polish Youth]. On its behalf, I was on the executive board of the student organization ZNMS "Życie", and in addition, during 1928-1929, I was its technician in the Mokotów, and later, Wola [districts of Warsaw]. In 1931, I transferred to the Communist Party of Poland, worked in the judiciary, and thereafter was transferred to organize the association “Agwid”. I was a Secretary of the Central Cell (that is, the cell attached to the Central Committee of the “Agwid”), and as a General Secretary [of this organization] for Poland. After the dissolution of “Agwid” by the police, I organized the democratic youth association "Żyd. [owska] Młodzież Demokratyczna" [eng. Jewish Democratic Youth], on behalf of the [Communist] party. In addition, I organized petty craftsmen, and craftsmen associations. I continued these activities after the party was dissolved, and until the beginning of military activities [the beginning of II World War]. In January 1944, I left for the army. From February 15th, I am with the Polish [Communist] People’s First Army; initially, on the board of the 3rd Division’s [publication] "Na Zachód", and thereafter, as a Secretary In Charge of the “Oficerska Gazeta”, and in the end, as a military correspondent of the newspaper 'Zwyciężymy' [eng. "We will be victorious"]." “I found out from the jail warden Grabicki that [Jozef] Dusza is fond of watching executions. I would also like to add that the investigative officers were neither allowed, nor were they required to be present there [during executions]; and I would additionally like to add, that this concerned carrying out sentences other than those under the jurisdiction of the Investigative Department. I had a conversation with Dusza about it, and additionally requested of comrade Grabicki not to allow him [Dusza] to have fun like this anymore. Only comrade Grabicki, or perhaps Leszkowicz could testify to this effect". “We were not allowed to leave the premises. We were allowed to go home once a month for 24 hours. We worked from 8 a.m. to 3 a.m. at night with breaks for dinner and supper. We were being continuously reassured, particularly by Rozanski, that this work is required of us by the [Communist] Party, and that we are working under its leadership. As far as the living conditions of the prisoners are concerned – they were kept in ordinary cellars, with concrete floor, without heat. They were kept primarily one man to a cell. They slept in beds and later, on wooden cots. They were well fed, but during the later period, Rozaski rationed meals based on the results of the interrogations. On Rozanski’s orders, a daily routine was established, along with an incarceration regime. For example, the prisoner could sit down only when he was told to do so, and would walk to the interrogations with his hands up". Above: Polish Communist secret police interrogators: Adam Humer, Markus Kac, Tadeusz Szymanski, Wieslaw Trutkowski, Tadeusz Tomporski, Edmund Kwasek, Roman Laszkiewicz, Eugeniusz Chimczak, Kazimierz Switon, Mieczyslaw Kobylec, Jan Pugacewicz, Pawel Szymanski, Leon Midro, Jan Dabrowski. 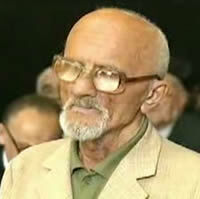 Above: Adam Humer, Polish Communist Secret Police, Urzad Bezpieczenstwa, the UB, interrogator. 1996 - Sentenced to 9-years of prison for torturing political prisoners. 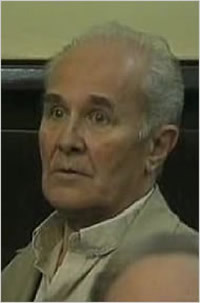 Above: Leon Midro, Polish Secret Police, Urzad Bezpieczenstwa, UB interrogator. 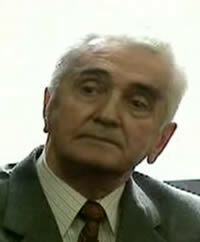 Above: Tadeusz Tomporski, Polish Secret Police, Urzad Bezpieczenstwa, UB interrogator. 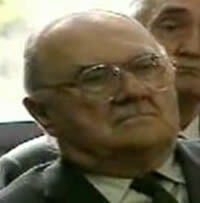 Above: Wieslaw Trutkowski, Polish Secret Police, Urzad Bezpieczenstwa, UB interrogator. 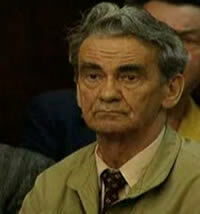 Above: Roman Laszkiewicz, Polish Communist Secret Police, Urzad Bezpieczenstwa, UB interrogator. Nicknamed byt the prisoners the "White Executioner of the Mokotow Prison "
"The church was [also] of great interest to us [in the Urzad Bezpieczenstwa], as it was the greatest source of support for the [Democratic] opposition. There were [detailed] notes, and exhaustive evidentiary folders about the enemies of the [Communist] system [that we kept]. It was enough that a supervisor said: - 'This, and that person needs to be taken care off’. We didn't have to be told what needed to be done [and what it meant]. The Soviet NKVD officers would recruit agents to cooperate with us. They [the NKVD] would train us in the use of the interrogation techniques." “The operational methods of the NKVD, which control every aspect of life, had permeated everywhere, and demoralized weaker individuals. 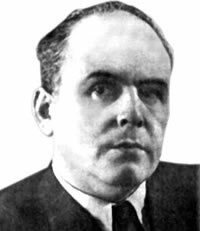 There are thousands of [communist] agents […] In comparison with the NKVD, the Gestapo methods are child's play.” General Leopold Okulicki, nom deguerre "Niedzwiadek". Left: General Leopold Okulicki (1898-1946), nom de guerre(s) "Niedziwadek", "Kobra" - the last commanding officer of the Home Army, murdered by the Soviet NKVD. UB (pol. Urzad Bezpieczenstwa, Bezpieka ) and SB (pol. Sluzba Bezpieczenstwa) expended considerable efforts to "break" the men and women who fell into their hands. There are three main utilitarian motivations for subjecting people to torture: extract information, terrorize those still at large and resistant, and to break down the personality and rebuild it in more pliable ways. It's effectiveness in terror is mix. Yes it creates fear. It also creates enemies. Caligula said "I do not care if they love me, so long as they fear me." This only worked as long as the Romans feared living under him more than they feared fighting him. Extracting information through torture has dubious effectiveness. As Napoleon said "The barbarous custom of having men beaten who are suspected of having important secrets to reveal must be abolished. It has always been recognized that this way of interrogating men, by putting them to torture, produces nothing worthwhile. The wretches say whatever comes into their heads and whatever they think one wants to believe." Thus we come to the one thing torture is very good at, making "wretches" and making them "say whatever they think one wants to believe" or rather saying whatever they think one wants to hear. So what is the benefit of torture to a tyranny? It is in the reshaping of the "wretches" perceptions - of themselves, their relationships, and their place in the world. When all sense of reference other than the torturer's mind is stripped away, there is little prospect for resistance and considerable prospect for cooperation. 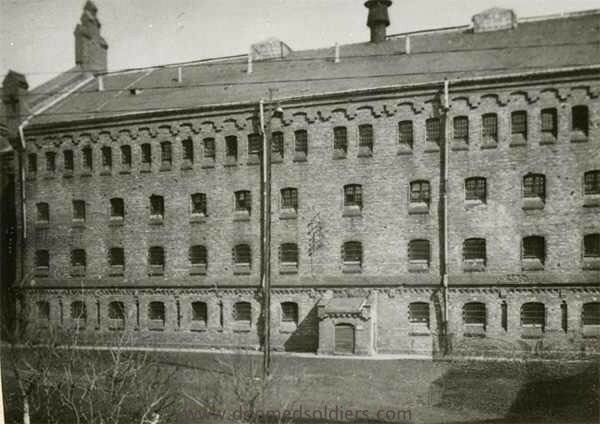 The Mokotow Prison at 37 Rakowiecka Street in Warsaw, and its dreaded Departments "X", "XI", known as "The Palace of Miracles" (pol. 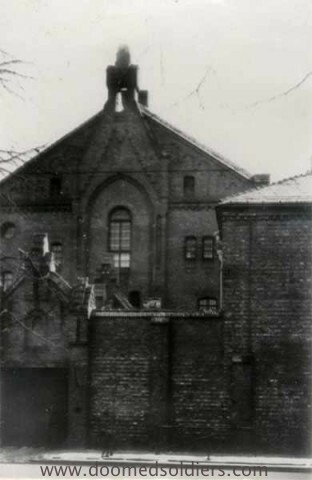 "Pałac Cudów"), was among the most sinister and dreaded houses of detention, torture and executions in Poland. Among hundreds of Polish patriots murdered there, were Cavalry Captain Witold Pilecki, Col. Łukasz Ciepliński , General Emil Fieldorf "Nil", Major Zygmunt Szendzielarz, "Łupaszka"", Major Hieronim Dekutowski, "Zapora", NSZ's Stanisław Kasznica, officers and soldiers of the Wolność i Niezawisłość (Freedom & Independence - WiN), Narodowe Siły Zbrojne / National Armed Forces (NSZ), Narodowe Zjednoczenie Wojskowe (NZW), and countless others who fought against the communism between 1944-1963, and beyond. In this video produced by "Gazeta Polska", Jacek Pawłowicz of the Institute of National Remembrance, IPN, takes us on a rare tour to one of the most hallowed places in Poland: "The Place Where Communists Murdered Polish Heroes." The show trial was the most visible effect. Getting someone to confess their crimes against the proletariat in public and indict opponents of the regime as co-conspirators shapes the minds of those with no access to any other information source. Repeated similar confessions from others who have also been so broken serve to overwhelm skepticism. Credibility increases and the common person begins to think "They can't ALL be lying." Beneath this surface lies a different sort of incrimination. Once the subject has so testified, without any prospect of public revocation, and indicted others in the course of so doing, they begin to accuse themselves. They become slanderers and traitors and co-conspirators of the tyranny within their own eyes. "It has been established that the NKVD and RB [sic UB, Urzad Bezpieczenstwa, Polish secret police] torture their prisoners terribly at the Chopin Street [police headquarters] in Lublin, at the Strzelecka Street [facility] in Warsaw, and in Włochy. The most popular methods of extracting confessions include slowly ripping off fingernails, [and] applying “temple screws” [i.e., clamps that crush the victim’s skull], and putting on “American handcuffs.” The last named method causes the skin on one’s hands to burst and the blood to flow from underneath one’s fingernails. The torture is applied passionlessly in a premeditated manner. Those who faint are revived with a morphine shot. Before the torture session [ensue] some receive booster shots [Pol. zastrzyki wzmacniające]. The torturers strictly observe the opinion of the supervising interrogating officer whether it is acceptable to allow [those] interrogated to die [….] At the infamous Lublin Castle [prison], because of the injuries inflicted during interrogation, mortality among the political prisoners reaches 20 persons per week." Quoted in Marek Jan Chodakiewicz, "The Dialectics of Pain".“O czym nie piszą szmatławce,” Polska i Świat, no. 3, vol. 7 (1 July 1945), Hoover Institution Archives, Polish Subject Collection [afterward HIA, PSC], Box 61, Folder Polska i Świat. Photo above: Kazimierz Moczarski, Polish Home Army - Armia Krajowa. Kazimierz Damazy Moczarski, nom de guerre "Borsuk", "Grawer", "Maurycy", Rafal", born 21 July 1907, died September 27, 1975 in Warsaw, soldier in the Polish Home Army (AK - Armia Krajowa - Polish Patriot: military), Head of the Bureau of Information and Propaganda in the last Polish Army General Headquarters and Polish Home Army. 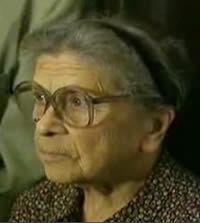 Arrested in August 1946 by the communists and sentenced to 10 years imprisonment (later reduced to 5 years) in January 1946. Tortured and deprived of medical help, he was not allowed outside of his cell for the period of 6 years and 3 months, devoid of all contact with the outside world (family letters, books and newspapers) for 4 years and 6 months, forbidden to have showers for 2 years and 10 months. In 1949, in order to humiliate him he was forced to share the same prison cell with SS-Gruppenfuhrer Jurgen Stroop, who was responsible for the destruction of the Warsaw Ghetto. 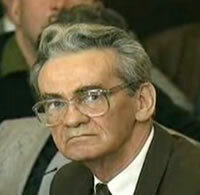 Moczarski was sentenced to death on November 8, 1953, however his death sentence was changed to life in prison. 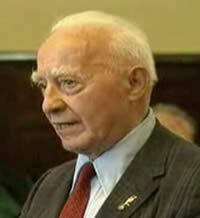 In April 1956 Moczarski was released from prison in Wronki, acquitted on all counts as well as rehabilitated by a court in December 1956. He would later publish a book entitled "Conversations with an Executioner" chronicling his conversations with the notorious Jurgen Stroop while incarcerated. Lt. Col. Dusza Jozef, Maj. Kaskiewicz Jerzy, Capt. Chimczak Eugeniusz, Lt. Adamuszek Adam, an inspecting officer [Ludwik Wlodarczyk], whom prisoners called Hiszpan or Gruby (currently one of the three inspecting officers of Mokotow Block A and wearing lieutenant uniform or civilian clothes; in 1949 he used to have a badge of the participants in the Spanish Civil War pinned to his jacket lapel; he is about 5.8 ft, obese, 40-something-year-old), the following inspecting officers: Tadeusz Szymanski (recently a Sc Lt of Mokotow Unit 10), Mazurkiewicz (recently a Staff Sgt for general purposes in Mokotow), Wardynski (Wardenski or Wardeski) Stanislaw (recently a Staff Sgt in Mokotow Prison) and many others, whose names I do not know, employed all previously described tortures and abusive methods against me with the consent and in the presence of Cols [Jozef] Rozanski and [Anatol] Fejgin as well as the Deputy Minister - general [Roman] Romkowski. 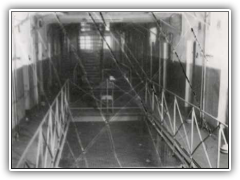 The latter declared - around 30th Nov 1948 and in the interrogation room situated on the first floor of Unit 10 as well as in the presence of Col Rozanski - that I will experience a "living hell" - and apparently he was right about it. I would also like to stress that not all of the investigation and inspecting officers of Unit 10 and Block A and not all wards, although clearly instructed and ordered as to the methods of torture and abuse, would gladly and eagerly employ them against me. The initial fragments of K. Moczarski's letter to the Chief Military Prosecutor Office dated 14 February 1955 are published in accordance with the description enclosed in K. Moczarski's letter to a solicitor, Wladyslaw Winawer, and sent from prison in Sztuma on 25th February 1955 - a typescript copy from the collection of Aniela Steinsberg. The content of this document, and its translation is being published here under the Greater Public Good doctrine. Notes: Maj. Jerzy Kaskiewicz, one of many of Moczarski's tormentors died in December 1999, and until his death lived on Spacerowa Street in Warsaw. Former investigative prison of Ministry of Public Security on Rakowiecka Street in Warsaw. Mokotow Prison In Warsaw - Former Ministry of Public Security (pol. Ministerstwo Bezpieczenstwa Publicznego) Investigations Prison on Rakowiecka Street in Warsaw. "My time is near. When they will be leading me out of my cell to die, my last words to my friends will be: I am happy that I will be murdered as a Catholic for my faith, as a Pole for my country, and as a human being [I will die] for justice and truth […] My last farewell will be only to you. I believe that the Holy Mother will take my soul […] and I will continue to serve Her and report to Her about the tragedy of the Polish Nation - murdered by one [nation] and abandoned by the others." 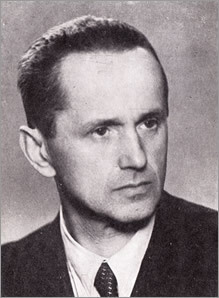 Lukasz Cieplinski, (October 26, 1913– March 1, 1951) writing from Mokotow prison to his wife Jadwiga. Stanislaw Skalski, Battle of Britain pilot, fighter ace. When were you tortured for the first time? - "This [proverbial] 'dance' began in March of 1949, or thereabout". - "Yes. [By] Humer, Szymanski, Serkowski, I think Midro also participated in it; then by jail section orderlies, etc". Under what circumstances did it [the torture] take place? - "I was summoned and was asked to undress naked, and to lay over a stool. My legs were tied. The guard stood with his legs spread over my head, and even hit me with a key, and then the 'polka' began. - "My mouth was gagged with a rug. I didn’t know what I was beaten with; [I didn’t know] if they were [wooden] sticks, metal [rods], or something else". How long would this process last? – "It was dinner time, I was [held] upstairs, I was in my cell, I think it was [cell number] 33. 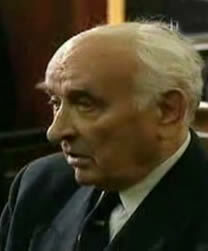 A guard came, from the main jail section and said ‘Stanislaw Skalski’, get out'. He took me to the courtroom in the main section, I think with a letter 'T'. Inside was Major [Mieczyslaw] Widaj, [who was] a judge, there were also two [civilian] members of the court, and some woman; I even suspect that they were Russians because they didn’t say a single word. There was an attorney [named] Wnuk there. 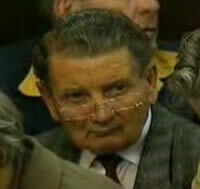 I don’t know who arranged for him [to be there], and on the left side sat attorney Maslanko, who was famous. […] After a week, I received a death sentence. It was 13 pages written in green ink, [that was signed by], I remember, Mr. Widaj. When I was lead after the trial by an older guard he asked me who was presiding over my case, I said – It was Widaj. He said – 'Man, if he gives you life, it’s as if you were sent free. He only gives death sentences". “We, the Home Army soldiers held a position, that the occupation [of Poland] didn’t end, but [in fact] it [still] continued. They [the secret police] were particularly furious that we represented the Home Army from the [Soviet annexed] eastern territory of the II Republic of Poland; including [the cities of] Vilno, and Nowogrodek. I was an officer - the second in command of the Home Army battalion in the Nowogrodek area”. – "Humer. I was interrogated for 8 to 10 hours every day for the first two months”. Were you beaten every time? – “Yes. Until I became unconscious”. Was Humer beating and kicking you? - Because I wasn’t betraying my co-conspirators […] I didn’t deny that I was involved in the resistance. I stood up against the regime that was imposed upon us by a foreign power. I confessed to that. It was my duty as a soldier”. They expected of you to either collaborate with the Urzad Bezpieczenstwa [Polish secret police] or to betray your friends? During these interrogations, did they threaten that if you will not cooperate with the Urzad Bezpieczenstwa, your wife will be arrested? – "I was sentenced to 13 years”. - "Yes. I think it was a very lenient sentence, considering the times". See also Battle at Surkonty. I noticed that Humer went to another room, and returned with a riding crop [pol. “nahayka”]. I noticed that metal bearing was hanging off a small metal chain that was attached to the tip of the crop. Humer was pacing around the room hitting himself nervously on the leg with it. He was very excited. I noticed that exactly. Then after Rozanski was apparently tired of kicking me - I was laying down on the floor - all others were beating me; Humer and others whose names I already gave. Humer was beating me with riding crop; somebody else also had one. I saw that to the side of me. I don’t know. Maybe one of them was beating me with a belt. I am not sure. But, each one of them was hitting me very hard with some sort of object. All of them were beating me; all over my body. I didn’t loose consciousness and I saw and heard everything. I also remember one very small detail. During these beatings Humer received a call. 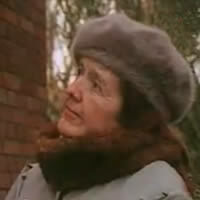 I even remember what he said: ‘Don’t wait for me with supper darling, I’ll be home very late, because I have an urgent matter to take care of here’. He was talking on the phone holding the riding crop in his hand. Suddenly, Humer said, ‘Now, let’s hit her in her kidneys, because it hurts more’. While others were pacing around the room, Humer was hitting my kidneys by himself with the riding crop, and counted as he went along. He counted one hundred fifty blows. After that, he said, ‘Somebody take over, I am tired’ but, ‘Give her another hundred fifty blows to the kidneys”. Then Chimczak and others were hitting my kidneys, and Humer who was standing over me was counting. After some time, Humer said to one of those in the room to spread my legs. I felt something [on my legs], but didn’t see, I couldn’t ... I couldn’t move my head … but, I precisely saw everything that was happening to the side of me. I felt that two [of them]; I felt boots of two people on my legs. They were holding me, you know, by my legs that were spread out, and Humer was hitting me with a riding crop in my crotch area. He was beating me for quite sometime”. With the part of the riding crop that had the metal bearing attached to it? – “Yes. With the same riding crop, and I was still laying down on the floor completely powerless. Then Humer called for a doctor. He made a comment, mentioned a name, and asked for such and such doctor only to be brought in. Naturally, the doctor arrived very quickly. He looked at me briefly. He didn’t examine me. He took my hand, looked at me for a moment, and said that there was no hope for me anymore because I was in agony. Then, Humer in particular, began to beg him to save me. But, not to save me because I am a human being, but because for some reasons they still needed me alive. I thought then, unfortunately I will live". Marian Skuza, Home Army (AK) / Wolnosc i Niezawislosc (WiN) Soldier. Were you imprisoned during the war? Where were you in 1945, at the end of the war? - “I was in Mauthausen”. Mouthausen[-Guasen], the [Nazi] concentration camp? When did you return [to Poland]? - “[I came back] in December, 1946. I was arrested by a gentleman, who was known to me then as Mr. [Izak] Fleischfarb; but his [last] name was later [Jozef] Swiatlo. That’s the one who later escaped to the West”. What did the interrogations looked like? - “They ordered me; it was always this way … they ordered me to put my hands on my knees. I didn’t do it the next time. They were punching me in the esophagus. Aside from spoons used to crush my testicles I didn’t see other instruments [of torture …]. At first, they would cuff my legs around my ankles, then they would cuff my hands behind my back, so I wouldn’t resist … you know I would resist, I was strong …”. Did you have to stand, were you sitting down, or laying down? - “When they were crushing my testicles? I was standing up. It was difficult [for them] with those spoons, because I would throw myself around. I was 30-years old. I was strong. Then they [the secret police] came up with new technique, probably suggested by Szawlowski, that they would not use the spoons, but while I was cuffed, they would put my testicles bag on the top of the drawer, and then they would close the drawer […] During winter, I would be thrown into the cell [with no glass in the window] while being kicked, they would close the door […] but, before that, a German who worked there [in the prison] would come … there were only Germans who worked there in this capacity. There wasn’t a single Pole there. Even the doctor was German. [His name was] Zeibold. They told this German to pour [cold] water all over me. I would be sitting in that cell for 48 hours at a time. It [the length of this torture] depended on how long I lasted”. Were you wearing any clothes [at that time]? - “No. I was naked. They would throw me into the cell naked […] They came and read to me that I was sentenced to death”. Maria Wlasik, Home Army / Wolnosc i Niezawislosc (WiN) Soldier. - “I was interrogated only by Wieslaw Trutkowski”. What did these interrogations looked like? - “On the first day, they wore the proverbial white gloves, by getting my [basic] personal information. They would write that down. I thought to myself - It isn’t so bad. Than, on the following day [they said] – ‘Start talking! I have nothing to say [I told them]. What am I to say? It started [then]. [From that point on] the interrogations were conducted with the proverbial red gloves on. One day, he [Trutkowski] says – 'Start talking! [I said] I have nothing to say. 'He said, I am going to make an 'airplane' out of you'. He turned a small stool with narrow square feet upside down, and told me – 'Sit on it! I said – 'I am not going to sit on it. I can’t sit on a thing like this [a stool leg]'. I told him – 'You show me how!. He said – 'Then, I’ll show you! So, he forced me to sit on it. He shouted - 'Spread your arms to the side'. You’ll have wings'. He lifted my legs up and held them on the top of his own legs. I was falling. The pain was unimaginable. I couldn’t walk. Everything was swollen […] I crawled back to the cell on my hands and knees”. Marian Golebiewski, Home Army (AK) / Wolnosc i Niezawislosc (WiN) Soldier. - It can only be explained by the fact that all those who were not willing to surrender to Moscow, and didn’t want to live enslaved, were arrested, and murdered”. - “I was beaten with bare hands, was kicked, was hit with fists, and in other sadistic ways. I was put against the wall, and was told to close my eyes because I was to be confronted [with a witness at whom I was not allowed to look at]. When I closed my eyes - I didn’t suspect anything - I was punched in the larynx. My head was pressed against the wall and was pointing up [as they ordered me]. I was punched with such force, that for many days afterwards, I couldn’t even swallow my own saliva; not to mention the food”. Can you tell us about the fate of the individuals shot to death at the Mokotow [prison]? - “I saw the group of seven members from the [Hieronim Dekutowski, nom de guerre] “Zapora” unit who were lead to their execution. At that time I was held in the general population unit, in the cell in which 96 other prisoners were held. The door had only bars, and was not made of solid material. Because of that I saw how they [the "Zapora's" men] were led to their death. Later, I observed through the window how [their bodies] were loaded onto a single horse wagon. The coachman had red hair. He would transport bodies [out of prison]. Then … After that ... I would like to mention [Jozef] Rozanski. Certain [prisoner] Gajewski from Wilno area – from Wilno you know; Rozanski was jumping all over his body with his feet; he [the Gajewski] was laying down …”. What did the interrogations at the Mokotow prison look like? - “It is very difficult to explain […] It is difficult for me to express this in words [crying]. What I had lived through was a gehenna; one grand gehenna. I was thinking that I will never leave that place alive: squats, beatings with some sort of metal bar used to flush the toilet, then more squats, sitting on a leg of a stool that is turned upside down. It would be repeated every day, every other day. 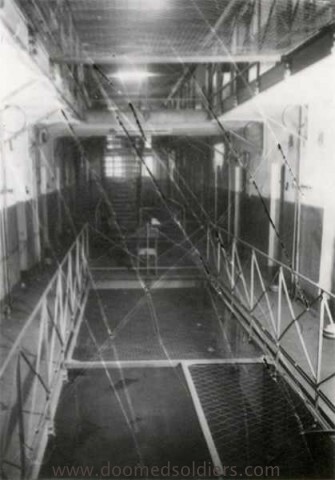 During the night, right after winter, I was taken on the so called “stojki” [the prisoner was ordered to stand for very long periods of time without moving], I would be stripped naked in the hallway, and I would be lead to the cell with the window removed. Then I would be put next to that window standing up. I wasn’t allowed to even slightly move my head; because the guard was making his rounds. When I was literally collapsing because of exhaustion, he would open the door and pour water all over me, and he would also kick me. And, so it was like this for 26, or 27 days nonstop. One would loose any sense of reality. During the day, they would drag me to the interrogations, and during night, they would take me to do the 'stojki'. I was barely alive […] I remember one individual by the name Ziolkowski. It was an older man; he was in his 50s. Before the war, he represented some sort of German firm. He was accused of espionage; alleged espionage. He was sentenced to death. One late afternoon, before evening, which was the usual time for [the secret police to lead the prisoners to their executions] from the cell for those condemned to death; they led him out as well. They ordered [other prisoners] to gather his belongings, a bowl, his blanket - it meant that they had executed him. They would lead three, four, and more people from this cell [at a time]; as well as single individuals. This man was taken away. We felt very badly about it. But, after several days he was brought back – to the same cell. It was … the same man, but his hair got so white; he had pitch-black hair [only days before]. He came back with this white hair”. - “[I was accused of ] aiding and abetting [the Democratic resistance], and was sentenced to 7 years”. Ruta Janina Czaplicka, Home Army (AK) / Wolnosc i Niezawislosc (WiN) Soldier. What did the interrogations look like? "[They were] beatings […] I was summoned to the [Jozef] Rozanski’s office. Inside [the office] was he [the Rozanski], and other men wearing military uniforms. I don’t remember how many of them were there. Immediately, they asked me to lay down [on the floor], and since I didn’t feel like it, they forced me down. And, then they were beating me”. - “I think they used belts with [metal] hooks attached to it – I am not sure though, it is difficult to look behind you [when you are beaten] you know”. What torture instruments did they use? - “I am not sure, I think they were some sort of belts with metal objects attached to the end, because I was bleeding all over”. - “Rozanski was hitting me with some sort of ruler. I was told to extend my hands in front of me, and when they swelled and closed from pain, he would jab me in my ribs with it; if I didn’t keep them in front of me, that is” […] It was at night; when they were taking me back to my cell (actually it was an underground dungeon) through a long hallway – I remember it was very long - I remember fainting, and that they poured water on me to revive me. Then, I heard that they [the secret police] were bringing someone in. I heard the sound of a stretcher, and someone who was lying on it had a death rattle sound when breathing, and was moaning. He had to be in a horrible condition. They walked down these small steps, and put the stretcher down. I could hear his nonstop rattling breath and moaning. Someone asked for his name. I heard his name very clearly. It was Tadeusz Labedzki” . Did you have any contact with this individual after that? “Never [after that day]. But, I remember that a friend of mine, [named] Leszek Roszkowski, was telling me that they even put his head under a [heavy] dresser [and slammed him with it]; and many other horrible things like that. I was held in the cell neighboring with that of Stanislaw Kasznica. 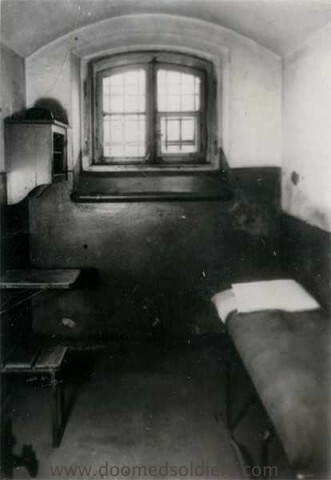 My cell was also next to [Witold] Pilecki’s cell as well. There were many prisoners whose cells were next to mine. I knew some of them [personally], or knew of them. My friend said, that Pilecki was said to be so horribly beaten, that his entire body was covered with stripes like a zebra. [… then] I got 10 years sentence”. Out of these 10 years, for how many years were you physically incarcerated? - “[I was imprisoned for] 10 years". 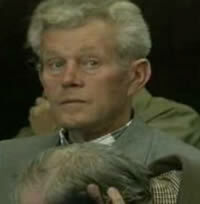 - “I can neither allow the investigation [into the murder] of my father to be closed, nor to allow the following individuals to escape justice: the Deputy Director of Justice at the General Prosecutors Office, Alicja Graff, the Prosecuting Attorney, Wiktor Gattner, and the Interrogator, Kazimierz Gorski. They could have refused [to take part in my futher's murder]. Above: General Fieldorf, Deputy Commander-in-Chief of the Home Army. Photo taken by Polish secret police, the UB, in 1950. General Fieldorf was murdered on February 24, 1953. No one forced them either physically or psychologically [to do it]. I demand that the people who murdered my father be brought to justice [...] I dream of Poland, whose institutions of justice are transparent and worthy of true respect and confidence. These types of institutions ought to be the foundation of a sovereign nation. I would want us, Poles, so much, to be able to choose our own examples to follow, and not those approved by others". "[Jozef] Rozanski would stop by frequently during many of my interrogations of General [August] Fieldorf [nom de guerre "Nil"], and he would have conversations with him on many subjects. The prosecuting attorney [Benjamin] Wajsblech would show up frequently as well, and would, on many occasions, give me verbal instructions. I prepared a decision to refuse the general's [defense] evidence materials. I wrote it under the dictation of Wajsblech. I didn't decide as to whom, and how, I should interrogate." "My [immediate] superior, Director [Leon] Penner told me that the condemned [General Emil August Fieldorf] is a traitor of the Polish nation, [and that he had] fraudulently reached the highest levels of the command in the [anti-communist] resistance by collaborating with the German occupiers. Then, Penner used very strong words against the condemned; they were swear words. The Deputy Director Graff was in Penner's office. I was given instructions about [Fieldorf's approaching] execution, and it was said that it concerned a particularly dangerous criminal; they gave me the documents in his file […] It was a room; probably without windows. It was brightly lit. After a few moments, a man wearing prison garb was led from the hallway. His head was not covered. He was led in by two guards. He wasn't led by force, but rather, they assisted him. This man didn't resist. He walked calmly. I stood looking towards the door. The condemned stood in front of me. After verifying his personal information, I began to read his sentence. I read the document that attested that the Council of State rejected his appeal for commutation [of death sentence]. I asked the condemned if he had any wishes. Fieldorf responded: - 'Please notify my family'. I stated that his family would be notified. I was nervous. I felt that my legs were shaking. The condemned persistently looked straight into my eyes. He stood erect. No one was holding him. He made an appearance of a very strong man. One would almost admire his composure amidst such dramatic events. He neither screamed, nor made any gestures. I said: Carry out [the execution]! The executioner and one of the guards approached the condemned […] I went to see the warden afterwards, and then by my own hand I prepared the protocol of the execution." General Emil August Fieldorf, Deputy Commander-in-Chief of the Home Army (Armia Krajowa), nom de guerre "Nil", was murdered by the communists on February 24, 1953. 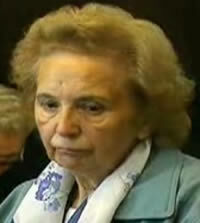 Danuta Socha, née Jakubczyk, nom de guerre “Rad”, daughter of Franciszek Socha, born on August 17, 1927 in Rzemien, Poland. Rank: Corporal. During 1942-1946, currier with the Bazow District, sub-district of the Polish Home Army (AK – Armia Krajowa). During 1946-1948, a currier attached to the IV General Staff of the Wolnosc i Niezawislosc (WiN), nom de guerre “Zakopianska”. The first days of the interrogations conducted by Roman Laszkiewicz, were attempts to intimidate me by screaming [at me], stomping on my dignity as a human being, and as a woman, physical and psychological torture, as well as the use of vulgar language. I was a 20-years old student then. My maiden name was Danuta Socha. In addition to the above mentioned [torture] methods, on February 17, 1948, I was inhumanly, and severely beaten for the first time by my tormentor, Roman Laszkiewicz. From this day on, he was beating me each and every day for the period of three months, on every part of my body with a rubber truncheon; he would hit me on the face with his fists, while demanding that I reveal names and addresses of members of AK [pol. Armia Krajowa – Home Army] and WiN [pol. Wolnosc i Niezawislosc – Freedom And Independence]. 3) I ‘agreed’ to testify to another interrogations officer, whose name I don’t remember, and gave him [only] names and addresses of people who were [already] dead, and names few AK members who were abroad. After few days, the interrogations were taken over by Roman Laszkiewicz again. As he was discovering during the interrogations about those additional ‘crimes’ mentioned above, he was beating me for each and every one of them. He was furious, that even after inflicting such horrendous pain upon me, he was still unable to make me scream, cry, or moan. I never cried in my cell either. I was silent; in order to spare the others from the feelings I was experiencing myself while hearing sounds of torment and tortures used by our tormentors against defenseless people. After three to 3-1/2 months, Laszkiewicz stopped beating me with the truncheon, and used other methods until the end of the investigation. 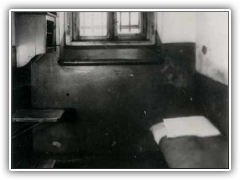 From the cell I shared with a snitch, named Jadwiga Samaniewicz, I was put in the so called ‘pojedynka’ [solitary confinement] where day and night they would interrogate and torture me. They wanted to finish me off psychologically. Samaniewicz reported to them, that it is more difficult for me to endure sounds of torture of other prisoners than my own physical pain. I couldn’t sleep at night hearing the moaning, screaming, and crying of people who were interrogated [on the floor above my cell]. The interrogations became less frequent. Laszkiewicz wanted to coerce me to give false testimony by forcing me to do squats, and demanded that for example, I should state that, I joined the WiN under the barrel of a gun. He was promising me only 5-years of probation if I cooperated. When I categorically refused, he assured me that I would be in prison until I die. During one of the interrogations, Laszkiewicz asked me what we [the prisoners] were doing in the cell between interrogations. When I told him that I walk a lot, and count for how many kilometers, they forbade me from walking anymore. They would keep the cell window open nonstop, which was yet another form of abuse. On the day of Holy Ascension (pol. Zielone Swieta) guards rushed into the cell and ordered me to run while screaming: ‘Can’t you run any faster? Are you afraid you are going to loose your virginity?’ But, I didn’t have any strength left in me – for almost a month my only sustenance was a cup of black coffee once every 24-hours. My stomach stopped digesting anything. They wouldn’t allow a doctor to help me. Obscenities such as ‘whore,’ and many others like this, that belittled me as a woman, would constantly come out of Laszkiewicz’s mouth. I filed a grievance with the Director of the Investigative Department Jozef Rozanski, (he spoke with me three or four times during my interrogations), demanding a medical exam that would contradict such insinuations. The medical exam was refused, and Laszkiewicz no longer called me a whore. Every morning, for about a month, while I was sitting during breakfast I was asked: ‘When are you going to hang yourself, or go insane?’ Laszkiewicz was assuring me that one night they will come for me and will finish me off. There were inscriptions on the wall of my cell that were scratched by the prisoners condemned to death who spent their last nights of their lives awaiting executions. They came for me one night – ordered me to pack my prison belongings – I had only a long jacket. I was certain that I would be murdered. My family didn’t know anything about my fate. Surprisingly, I was at peace. They lead me upstairs, and there among other things, it was said: ‘Who is your interrogating officer?’ I stated that I don’t know. Earlier, during interrogations, another interrogator by accident mentioned in my presence the real name of my tormentor. I remembered it. It was Roman Laszkiewicz. On September 11, 1948, a court proceeding RE: SR 985/48 [concerning my person] took place. I was sentenced by the Regional Military Court to 9 years of prison along with revocation of my citizen’s rights for 3 years, and forfeiture of personal property. After serving seven and a half years, on August 25, 1955 I was released from prison because of my poor health. On the decision of the State Council [pol. Rada Panstwa] from August 17, 1955, the remaining 1.5 years were changed to two and a half years of probation. The interrogations and imprisonment had left me with: severe problems with my nervous system (particularly heart problems, accelerated heart-rate, 120 heart palpitations per minute), low blood pressure, edema of my lower extremities, and hernia. The prison physician in Frodona determined that I am unable to perform physical labor, and have clinical resentment towards the Russian language (because of Laszkiewicz’s accent), and clinical fear of police. The latter subsided only after some time in Canada. To this day I am unable to tolerate crying, screaming, and moaning because I can still see the Mokotow prison dungeons on Rakowiecka in Warsaw, before my eyes. I have lived in Cananda since November 14, 1959. I believe that I survived because of Divine Providence and a strong will to live. Roman Laszkiewicz is not that much older than me. I believe that it is my duty and moral responsibility to give the testimony of truth. 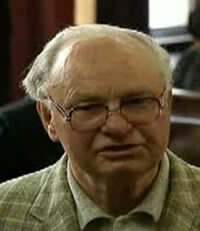 Roman Laszkiewicz, my tormentor in 1948, is a liar, and a coward who to this day denies [partaking in Communist crimes]. Source: TVP1 : "Humer i Inni" [eng. "Humer & Others"] in Polish. Tadeusz Labedzki, (Dec. 24, 1917 - June 9, 1946), Polish politician, soldier in the NZW (National Military Union), born in Philadelphia, PA, United States. He was arrested on April 7, 1946 by Polish secret police, the UB. After enduring horrific tortures, Labedzki was murdered on June 9, 1946 along with his co-conspirators, Tadeusz Zawodzinski, Jan Morawiec, and Leszek Roszkowski. His body was disposed in an unknown location. His place of burial is unknown to this day. 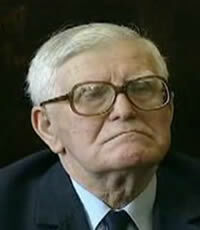 Zbigniew Bernatowicz, nom de guerre "Basia", "Mis", "Zdzichu" was born on April 14, 1924 in Radzyn Podlaski. He was son of Stefan and Karolina née Kielba. 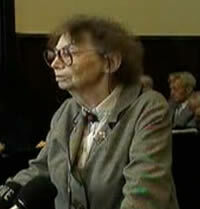 During Nazi occupation Bernatowicz served in the Home Army (pol. Armia Krajowa). After the war he continued in the ranks of Home Army and and later WiN (pol. abr. Wolnosc i Niezawislosc - Freedom And Independence). From February 1947, he was in charge of the Information-Intelligence unit of the General Staff of WiN code-named "Instytut Bakteriologiczny" (eng. "Bacteriological Institute"). He was arrested on February 7, 1948, and sentenced to death by WSR (pol. Wojskowy Sad Okregowy - District Military Court) in Warsaw on October 8, 1948. He was executed on January 27, 1949. The images appearing on this page are published here in accordance with the Greater Public Good doctrine.